This page will show some of the Texas Department of Public Safety's earlier Ford Mustangs. The pictures shown are on loan and have been made by another source unless otherwise noted. Above: A 1984 Texas DPS Mustang sits at a trooper's residence near Diboll, Texas. This Texas DPS Mustang had blue interior and a 4-spd manual transmission. Its original DPS fleet number was F4-443. This DPS Mustang was destroyed in a police chase & accident on South First street in Lufkin, Texas just ONE day prior to being recalled from police life. Photo courtesy of retired Trooper Steven J. Sikes. Information courtesy of Tom Selman. Above: A pair of 1984 model Texas Highway Patrol Ford Mustangs sit together at a trooper's residence in Boerne, Texas. Photo courtesy of retired Sergeant D.L. Pruett. Above: Trooper Kyle Dean, THP-Crockett writes a citation to a violator driving a Ford Mustang GT! Trooper Dean's partner, Trooper Bob Reeves took the photograph. Pictured also is their 1985 Texas DPS Mustang. Traffic stop on Texas Highway 7 east of Ratcliff in eastern Houston County in summer 1986. 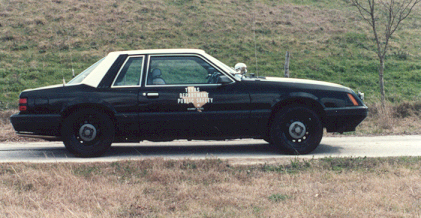 1985 Texas DPS Mustang used in the Boerne, Texas area. Picture courtesy of retired MVT Sergeant D.L. Pruett. and Kyle Dean in Houston County near Crockett. Above: Trooper Dwayne Pruett poses next to one of Texas' first Ford Mustangs, a 1983 model. Picture date: November 8th, 1983. Is it my imagination or does Trooper Pruett resemble "Junior" from Smokey and the Bandit? Above: Two unidentified Texas State Troopers standing next to their DPS Mustang are trying to determine what happened at this accident scene. Picture date: Unknown. Above: A 1984 Texas DPS Mustang sits at a major accident scene on IH-35 during a snow storm. As a joke, the trooper built a small snowman and placed it on top of the car. The trooper said it stayed on there for nearly 36 hours before it began to melt! Below: A 1985 Texas Highway Patrol Ford Mustang sitting on the side of the road in rural east Texas. Below: Another 1985 Texas Highway Patrol Ford Mustang. Above: The two pictures above are of a 1985 Texas DPS Mustang. Real nice side views! Above: A 1983 Texas DPS Mustang pictured here in Tyler, Texas after having a roll bar installed in it. 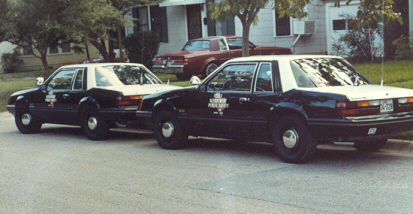 The Texas DPS bought 23-24 1983 SSP Mustangs and installed roll bars in nine of them. Photo and information courtesy of retired Sergeant Dwayne L. Pruett. 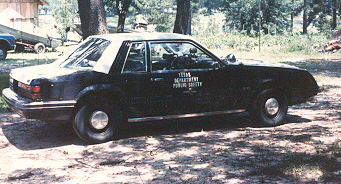 This is a picture of an old 1985 Texas DPS Mustang while it was still in service. Photo courtesy of Trooper Don Plunkett, THP-Victoria.